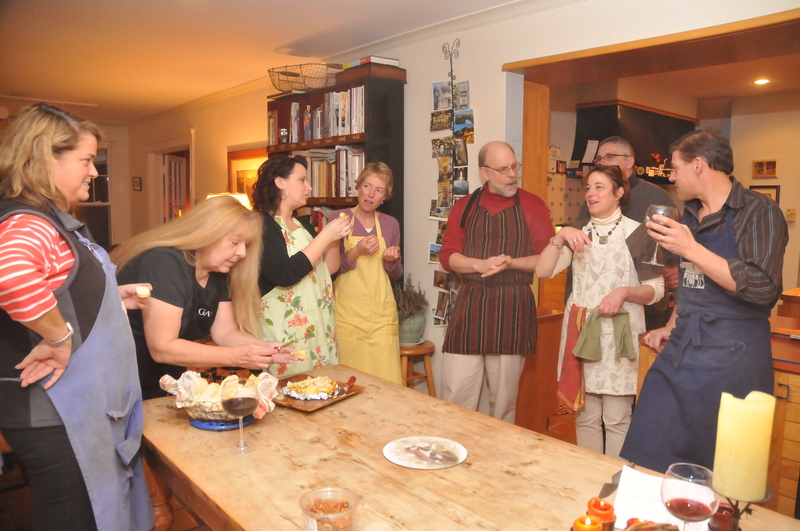 OK – I worked for hours with recipes and great photos from last weeks class. Something crashed when I went to publish it all. So sorry. I will work again later today and hopefully by tomorrow – all will be well. I don’t want everyone to miss the wonderful photos from Brian. Class was held on Thursday October 28. At the end of the evening when everyone had gone, I sent an email out to those who attended. The dishes are done. The tables are cleared. The tea and coffee are set out for Friday morning. There were hardly any leftovers to pack away. The glow of the evening is with me. Thank you all for coming and making the “first night” so much fun and so successful. My heart is happy and so is my kitchen. Today is the first day. The first day on the new blog. I start teaching my cooking class this Thursday. Watch out kitchen! I have reached out to friends and colleagues to come and join me in my kitchen and learn about my love of food. I love to cook it, I love to share it with my family and friends. Now I can share it with the world too.